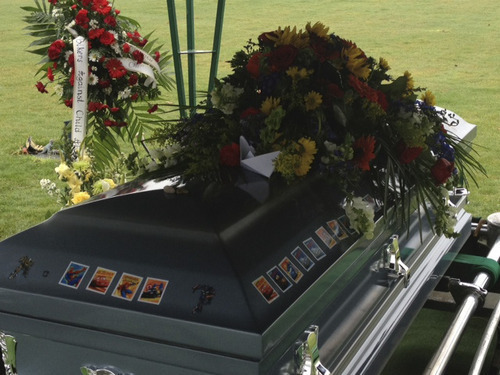 Burial • Powell cousins adorn casket with stickers of "good guys." Puyallup, Wash. • Charlie and Braden Powell were lowered into the ground Monday just as they had spent most of their lives together: side-by-side as brothers. The boys, ages 7 and 5, shared a single casket and were surrounded by family members who gathered to offer poignant last tributes in a quiet graveside service. The boys' maternal grandparents, Chuck and Judy Cox, arrived at Woodbine Cemetery in Puyallup at 10 a.m., driving past rows of purple and blue balloons lining a neighborhood street nearby in honor of the boys. A group of nine family members gathered around the casket for a dedication, before the boys' aunts handed out Lightening McQueen stickers from the movie "Cars" as well as Spiderman decorations to adorn the sides of the casket. 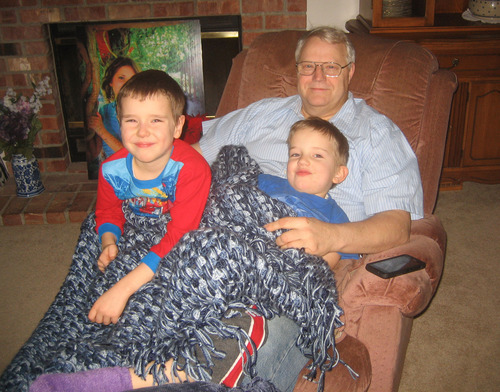 The boys loved the characters, the family reminisced. But on the outside of the casket, only stickers of their favorite heroes were allowed. Villains from the movies on the sticker sheets were set aside in a conscious effort to keep them away from any more evil, even if the stickers only represented fictional characters. "Only the good guys," Chuck Cox said, watching his daughters and grandchildren line stickers up neatly across the casket at the service. The family took several teddy bears nestled in floral displays from the cemetery before leaving  small mementos to remember the boys, who adored stuffed animals. The Cox family departed and several members of the Powell family  including the boys' aunt, Alina Powell, uncle John Powell, aunt Jennifer Graves, grandmother, Terrica Powell  held their own private gathering at the burial site a short time later. The Powells held a short service with music and speakers who shared memories. The children's uncle, Kirk Graves, placed a paper boat atop the coffin, a remembrance of a Thanksgiving encounter with his nephew Charlie, who had made a boat as an art project during the holiday. The Coxes later returned to oversee the children's casket being lowered into the ground. The grave is designed to hold an additional casket, if the remains of the boys' mother, Susan Powell, are found. Missing from her West Valley City home since 2009, Susan Powell is presumed dead by her family, who have also said they believe her husband, Josh Powell, killed her. Josh Powell murdered his sons and took his own life in a gasoline-fueled fire at his Graham-area home. It's unclear when and if services for the 36-year-old Josh Powell will be held, but it's unlikely he will be buried near his children. A cousin of the Powell boys, 6-year-old Dakota, asked her mother, Denise Cox, at Monday's burial why there were photos of Charlie and Braden next to the casket, but none of the boys' mother. "Susan's not in there. Charlie and Braden are in there," Denise Cox told her daughter gently. "We're still looking for Aunt Susan." After the service Monday, Denise Cox said she is holding on to the good memories of her nephews as she tries to move ahead after the painful loss. She recalled tucking her nephews into bed shortly before their murder, when one of them gave her a bear hug and said "I love you." "I try to keep thinking of the happy memories," she said. "I'm so glad I had the time with them that I had." Investigators searched a Graham-area recycling center based on a tip that Josh Powell dropped off papers there before killing himself and his sons. Pierce County Sheriff's spokesman Ed Troyer on Monday said officers found a testament with Powell's name on it, some paperback books with his wife's name on them and a Utah map.